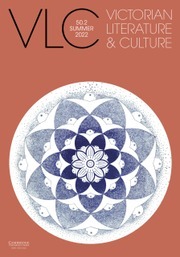 Victorian Literature and Culture seeks to publish innovative scholarship of broad interest to the field. We are especially interested in work that contributes or responds to the current moment of heightened methodological reflection, theoretical energy, and formal experimentation. We welcome submissions that aim to reimagine the field of Victorian studies in the twenty-first century, whether by interrogating the field’s scope, boundaries, methods, and shibboleths; leveraging new or neglected conceptual resources; exploring new archives; discovering or establishing new cross-field connections; or engaging anew with the field’s own history. We are open to experiments in genre and form and welcome queries about the suitability of particular submissions. This cover story from the New York Times Sunday Magazine (13 January 2019) examines a topic (the evolution of beauty) and scientist (Richard Prum) in much the same way as the long review essay “Why Beauty Matters” by George Levine - featured in the latest issue of VLC (47.1).